Thanks for your great letter. I know you wrote it a long time ago –- you’ve probably forgotten about it by now – but I want you to know that I really, really appreciate that you took the time to read my book, BYSTANDER, and send along a typed letter. I’m also in the middle of writing a crazy (and fun, and funny) book about about a 12-year-old zombie, but I don’t like to talk about books until I finish them. Thanks for reading my book, and thinking about it. I loved your line, “This is one of my favorite books because it shows how life really is, the side of things that no one really wants to see even though we know it is all around us. The news has been so sad, so disturbing, so upsetting lately. It’s as if the world has woken up and suddenly, wherever you look, there’s news and columns about bullies and victims and bystanders. Most people outgrow their childhoods, but James Preller relives his almost every day. Preller, best-known for his “Jigsaw Jones” children’s series, is an author who never underestimates young readers. “I think from an outsiders’ point of view, people think kids’ books are light and fluffy — until they start reading them and see what’s out there,” Preller said. The writer, who has published everything from picture books to young adult novels, will appear on April 15 at Barnes & Noble in Saratoga Springs. His most recent book, “Bystander,” tells the story of a new kid in town who witnesses bullying at his middle school. 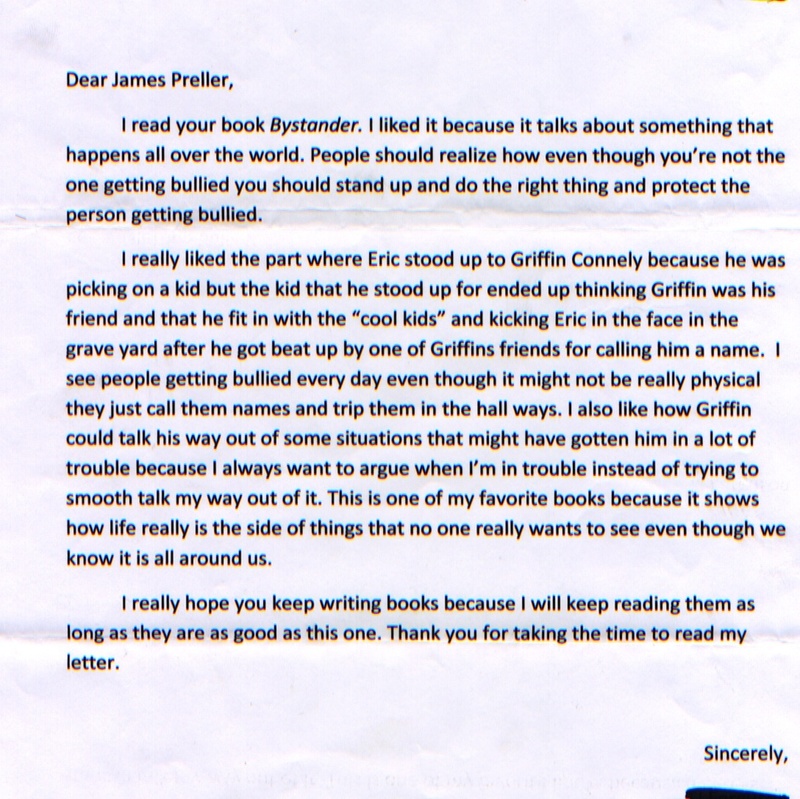 Although bullies are not a new literary topic, Preller worked to approach the subject from a different and more honest perspective. The author, who lives in Delmar, made the story more complex than just a big kid at school muscling other students, and he didn’t want to give the book a Hollywood happy ending. He does, however, believe most students [given support] are strong enough to overcome the negative experience and move past it. “Bullying does reach its peak in middle school and does tend to diminish as kids get older. When we look back, we survive it and we get through it. It’s not that we triumph and all the bad guys learn a valuable lesson, but the rest of us can figure out how to diminish the harm they do,” he said. In the book, Preller makes it clear that boys aren’t the only ones who engage in bullying. A group of girls in the novel uses the Internet to harass a fellow student. “Cyber bulling is absolutely a problem. I think with girls, that’s where you tend to see more of the cyber bullying,” he said. Although the book covers difficult territory, Preller said he made an effort to keep the story entertaining for young readers. “When you write a book like this that maybe has a hot topic, it gets lost that you are still trying to tell a good story. You don’t want the reader to be conscious that they are being taught a lesson. If they feel that they are, they are going to put the book away,” he said. For a sample chapter, click here. And lastly, this blog is filled with background information on the book. Just click on “Bystander” under categories in the right sidebar. I think this entry was especially relevant.